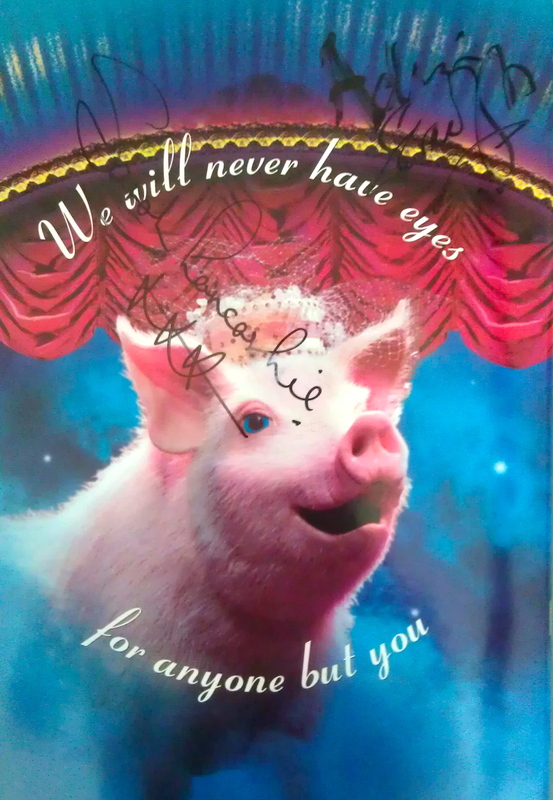 A last goodbye to Betty Blue Eyes… perhaps! 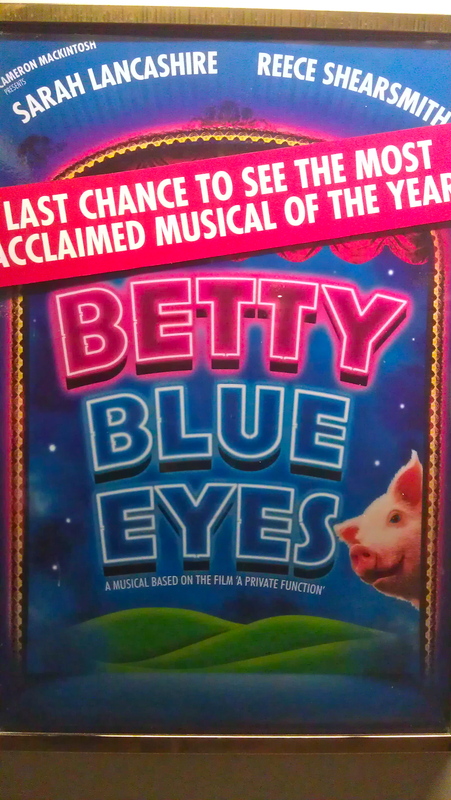 On Saturday evening I took Max to see Betty Blue Eyes, as he’d never seen it before (and I knew that if there was ever a musical made for him…! heh), and I was desperate to see it at least once more before it closes on September 24th 2011. (as an aside, I also had managed to absolutely convince Max throughout the day that he was going to see a real live well-trained pig!! haha! I got a very swift punch when Betty was wheeled out, and could see him blushing in the dark, haha!! x!). 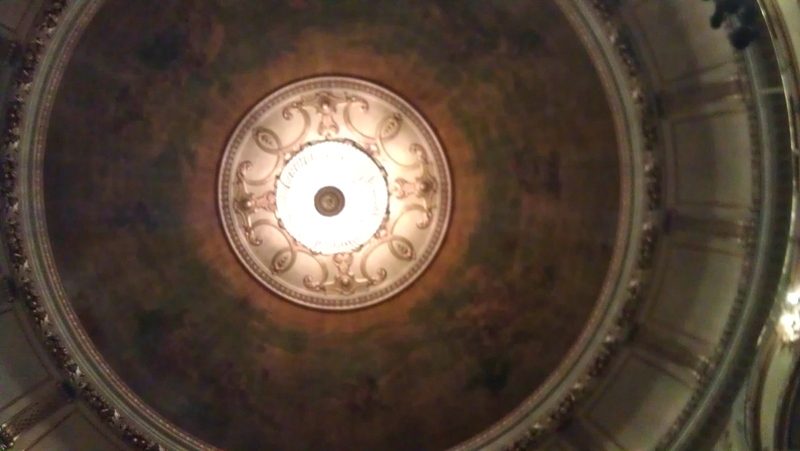 Incidentally, the ceiling at the Novello Theatre has to be one of THE best in the entire West End of London! This photo really doesn’t do it justice, as you can’t see the chandelier properly, or the colours/paintings, but you get a rough idea! After the show, I went to Stage Door to get my big glossy souvenir programme signed (only £5, guess they’re trying to shift these, don’t think that they were always this cheap!). After a few marker malfunctions, I managed to get the autographs of Adrian Scarborough (Wormwold) and the stunning Sarah Lancashire (Joyce Chilvers, leading lady!). With Adrian, I had a bit of banter as the marker that I brought out was ridiculously sized and not really fit for purpose, but he kindly struggled on anyway! When Sarah came out, a chap kindly lent me his normal size sharpie, and I managed to get an autograph from her. Sarah was absolutely charming at stage door, and freely discussed Betty Blue Eyes, and the reasons for it closing (apparently it is nowhere near even recouping its initial investment, let alone its running costs) which is a HUGE shame, as I’d genuinely tout this as one of the best musicals in the West End at the moment! I think we all agreed that, in the end, we hoped that they’d put it to rest for a few years, get it out on tour and repackage it and eventually bring it back. Once all the folk had started to go, and after Sarah took a few last-minute pictures with them, she then looked back across at us to make sure she’d missed nobody out, and so I asked if she wouldn’t mind, as I didn’t want to be any bother! She was more than happy to oblige, which was really kind of her! 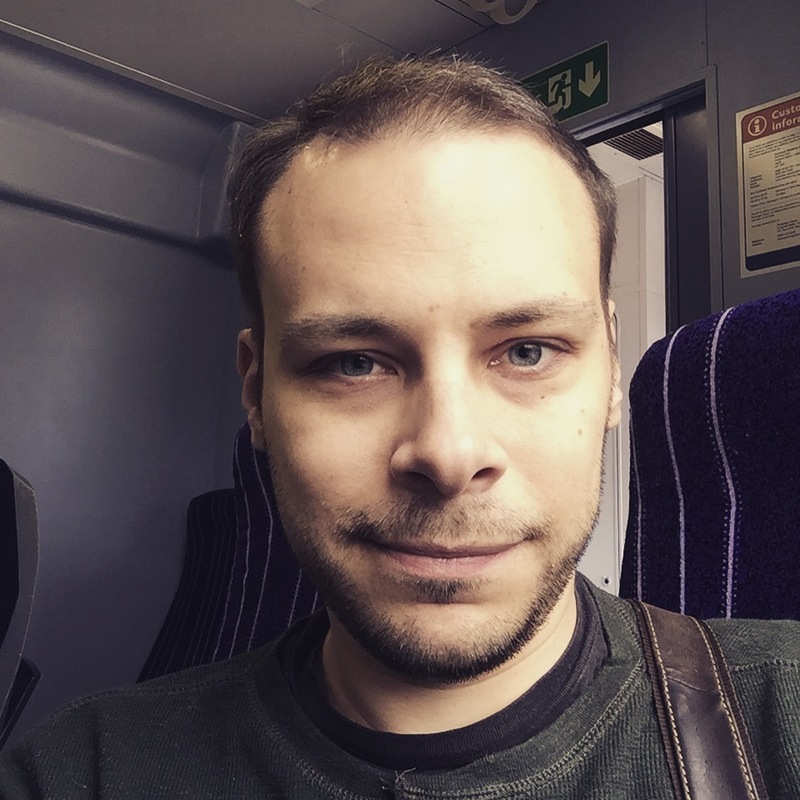 I’ve only just gotten over my shyness in asking people for autographs, this is certainly the first photograph that I’ve ever had taken haha!!! I can still feel her pressed up against my right side haha, I may never wash this arm and cheek again!! haha!!! Really wish I’d had a shave before though, as I look minging! heh! 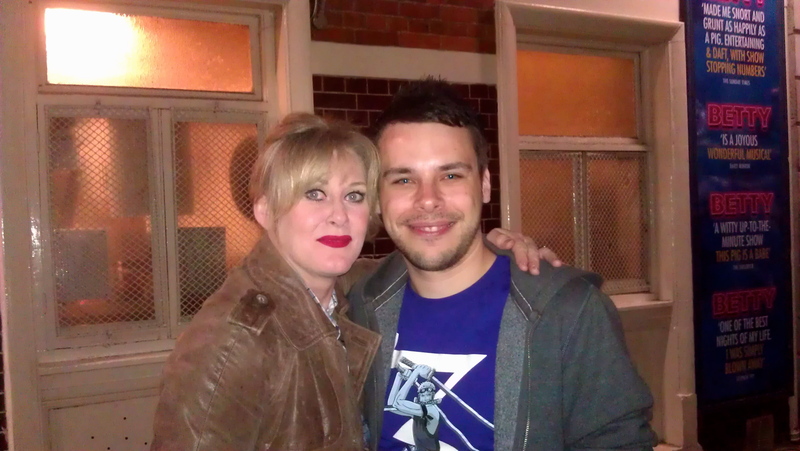 The above might sound a little creepy were it not for the fact that, as a Northern boy, growing up in Manchester, Coronation Street around 1991-1996 was ‘my time’ haha, so I’ve pretty much followed Sarah Lancashire’s career since then to be honest – it was a pretty big deal for me, hehe! (esp as I love her character so much in this, and tend to sing ‘Nobody’ at home in my dressing gown a lot, haha – perhaps something I should not have mentioned to her, haha!). After the photo, and despite it being a two-show day, she even took a little time to chat for a while, which was really really kind of her (and great for me, as everyone else had cleared off by then!). She asked where my accent was from (as she’s from Oldham herself), and then asked why I was down in London etc, showing genuine interest, and she said a huge ‘awwww’ when I told her that I was thrilled to meet her! hehe! Then we discussed the show, and why we both felt that it was closing (Sarah agreed with me!) and I said that I was sorry to hear that she (and everyone else) had all lost their jobs so suddenly. I asked if a move to the West End may be something that she’d consider doing more often than screen now, but it seems to very much depend on what is next offered – personally, I’d LOVE to see her in something like a West End production/transfer of Sweeney Todd or similar.